I am working on a design that includes a synchronous belt drive system. How do I know which pulley tooth profile to select for my design? Timing belt & pulley systems are employed in various manufacturing and production settings to facilitate workpiece and material movement. The process of pulley tooth profile selection can be a daunting task due to the vast quantity of various tooth profile shapes as well as the seemingly countless number of patented profile modifications available. However, there are a few principles which will better equip the engineer to make sense of the pulley tooth profile selection process. For simplicity, most tooth profile shapes can be generally characterized somewhere on the spectrum between a standard trapezoidal tooth profile, where the teeth are quite literally trapezoids of varying heights and steepness, and a specialized rounded half-circular, curvilinear tooth profile. 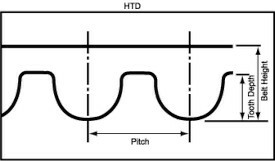 The standard trapezoidal tooth profile (A) is controlled by the ISO 5294:2012 standard while curvilinear profiles (B) are usually more customized and depend upon vendor specifications. Because of this, the standard trapezoidal tooth profile is generally the more widely used profile. In contrast, the rounded specialized curvilinear tooth profiles are a relatively new innovation in pulley tooth profile design and do not possess any of the sharper dimensional transitions of the harder trapezoidal profiles. Although both specialized curvilinear and standard trapezoidal profiles are capable of transmitting substantial torques, the subtle differences in shape must be noted. This will enable the engineer to better understand how profile shape may affect the system’s load carrying effectiveness as well as the impact of backlash in the system due to tooth shape variations. The first principle to grasp is the concept of backlash, which is generally defined as clearance or “free play” between any two mating parts. In this context, it’s used to describe the play between the pulley grooves and belt teeth. A small degree of backlash is built into the system in order to ensure that sufficient clearance exists for the belt teeth to enter/exit the pulley teeth without binding, ensuring that the belt teeth do not wear prematurely. Too much backlash between the mating teeth may result in excess noise, increased wear rates, and could even lead to belt slipping at higher torques. Trapezoidal tooth profiles inherently produce very little backlash which mitigates risks of slipping or jumping a tooth under low to moderate torques. Unfortunately, the trapezoidal profile geometries possess sharp stress concentrations at the belt tooth/pulley groove interface, and these can also lead to increased belt wear rates under high torque and high speed applications. The specialized curvilinear tooth profiles have been developed in order to improve the shortcomings of the standard trapezoidal tooth profile and alleviate the concerns associated with the high stress concentrations at the trapezoidal belt teeth by rounding out the sharp transition thereby evening out the area of contact between the pulley/belt teeth. For this reason, specialized curvilinear tooth profiles are usually the better choice for applications requiring high torque transfer capabilities such as a mechanical hoist or elevator. In addition, the curvilinear tooth profile also aims to reduce backlash compared to the standard trapezoidal profile, leading to quieter, smoother operation of the drive. This is especially important in high speed and high frequency applications such as those seen in a belt drive used to power a large industrial blower. Finally, another advantage of the rounded profile is that it allows for smaller belt installation tensions, significantly reducing bearing loads on the pulley. In conclusion, a standard trapezoidal tooth profile should be more than adequate for lower torque transfer applications where small amounts of backlash will not cause significant noise or wear concerns, such as a low speed light conveyor. However, for an application such as a high speed elevator or hoist, where high torque is required and backlash must be controlled to an absolute minimum in order to mitigate belt slipping, a specialized curvilinear tooth profile is the better bet. If even more control of backlash is required in the application, more advanced, modified curvilinear tooth profiles have been developed which effectively further round out the tooth profile in attempt to further reduce system backlash and guard against slipping or noise. These tooth profiles are typically employed in applications ranging from large, high speed centrifuges to high capacity pumps. As stated previously, due to the large number of features that are available across the various tooth profiles, there are numerous considerations that must be taken into account. However, the principles here should provide a good basis for the engineer to begin the pulley tooth profile selection process.